Left to right, top to bottom: Ed Baird, Malin Burnham, Bill Ficker, Electra Johnson, Irving Johnson, Bob Johnstone, Rod Johnstone, Tom Perkins and Dave Ullman. Bill Ficker, Dave Ullman and Mailn Burnham to be honored at October event. 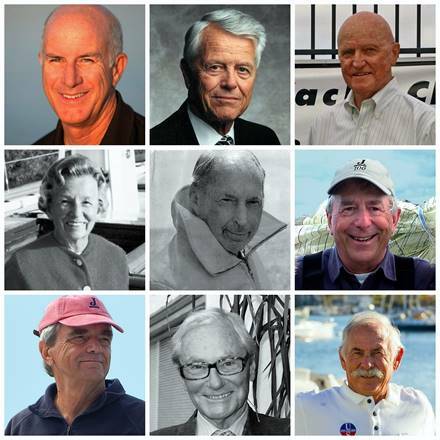 ANNAPOLIS, Maryland — The National Sailing Hall of Fame (NSHOF) on July 11 announced the nine people who will make up its 2016 class of inductees – four of the honorees hail from California. Legendary sailing champion (Star Worlds, Congressional Cup and America’s Cup) Bill Ficker (Newport Beach, California); yachtsman and sail maker Dave Ullman (Newport Beach, California); as well as America’s Cup sailor and Star World Champion Malin Burnham (San Diego, California) and the innovator behind the modern square rigged superyacht The Maltese Falcon, Tom Perkins (Belvedere, California) are among the honorees. Rounding up the nine inductees are: America’s Cup winning helmsman Ed Baird (St. Petersburg, Florida); husband and wife sail training pioneers, adventurers and authors Irving and Electra “Exy” Johnson (Hadley, Massachusetts); brothers and J/Boats founders, Robert Johnstone (Newport, Rhode Island) and Rodney Johnstone (Stonington, Connecticut), respectively, marketing guru and boat designer; each of whom is being recognizing with a Lifetime Achievement Award. Inductees are American citizens, 45 years of age or older, who have made significant impact on the growth and development of the sport in the U.S. in the categories of Sailing, Technical/Design and Contributor (coach, administrator, sailing media). The 2016 class of inductees will be celebrated on Oct. 30. The invitation-only Induction Ceremony will be held at the St. Francis Yacht Club in San Francisco, California. For more information, visit halloffamers.nshof.org.